So I finally gave in. The trend of Hunter Boots now has all of the cache of UGGs...virtually none. The purchase was likely inspired by my recent trip to London. However, I do always say you can't mess with a classic and that's what Hunter Boots are...simply classic. 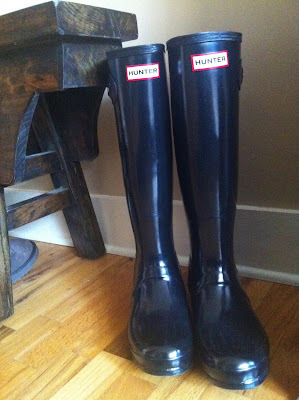 I would extol the virtues of the Hunter wellie but I am sure you poshinistas could cite them in your sleep. After getting over myself I have to admit they are pretty fabulous wellies and will definitely make the rain/sleet very fashionable. Stay Posh! Finally got the Hunter Navy boots. Original pre-sale Bloomies friends and families. Love them. I think I may buy the socks too.